Central America has yet to gain full control of its armed forces. Militaries, where they exist, continue to exercise too much influence while enjoying impunity and outsized budgets. Meanwhile they continue their historically close relations with the United States government. Yet none of the security threats facing Central America today, Altered States argues, requires a military response. In fact, the consolidation of peace and democracy depends on even deeper reductions in military structures -- and, where possible, their complete abolition. 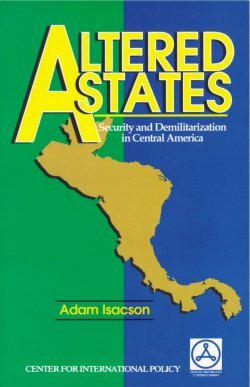 Altered States builds this argument from an exhaustive survey of current military sizes and roles in Central Ameica, the entire range of threats to the region's security, the extent of current U.S. military assistance and linkages, and the building of collective-security guarantees. Altered States is the product of a three-year collaboration between Costa Rica's Arias Foundation for Peace and Human Progress and the Washington-based Center for International Policy. Be sure to include your address and number of copies requested. We will ship you a copy (or copies) immediately. Option 4: Fill out the e-mail form below. We will ship you a copy (or copies) immediately. Books delivered by mail are $15.00 per copy ( ($17.00 per copy outside the United States, Canada and Mexico; $17.00 if by 2-day priority mail; $25.00 if by overnight express mail); payment will be due upon receipt. Please send me copies of Altered States.